Tattoo designs are often deeply personal expressions and so it is not always possible to find a ready-made design that is exactly what you want. For this reason, we are proud to offer completely custom tattoo designs where we work with you on the translation, the font, and the layout. This is a completely custom design where you will be working directly with Master Japanese Calligrapher Eri Takase to create a design that is just right for you. With over fifteen years of experience and thousands of satisfied clients, Master Takase is the perfect partner to work with to create a Japanese tattoo that is uniquely for you. Master Takase’s work has sold all over the world as custom art for individuals, on commercial products, in books, print and in film. Her brand of Traditional Japanese Calligraphy has been described as refined and cultured. She has been praised not only for her beautiful art but also for her approachability, courtesy, and professionalism. Your custom tattoo design starts when you place your order and describe what you would like. We would then create several options for the translation and present you with several sample designs with different fonts and layouts. These hand-lettered designs by Master Takase are then scanned, documented and emailed to you along with a detailed explanation and links to on-line Japanese dictionaries and other independent resources. This way you know the translation is correct and we are happy to provide you with as much information so you are as happy with the translation as you are with the design. You can then examine the designs at your leisure and decide which samples you like and the direction you would like to proceed. And in this fashion, you and Master Takase would work together to create a design that is exactly what you want. The design process is fun, informative and normally takes two or three sample sets to arrive at the perfect design. When all is finished the final design, along with the line art and explanation, is emailed to you. All you need to do then is print the design and take it to your tattoo artist to have the design inked. Your tattoo artist does not even need to know Japanese! We give you everything you need. And all this entire process can be done in as little as a few days. If you have questions or would like to learn more please contact us. Stock calligraphy will not always reflect you and what you want to say the way you want to say it. Body Art is about expressing yourself and can be as unique as you are. The creation of the design should be a collaboration between you and the calligrapher, an interactive process, resulting in a unique work of individual expression. Japanese Calligraphy designs require absolutely correct translations. One needs to be sure that the design has the intended meaning and has a visual presentation that fits you and your style. Takase Studios has both a native English speaking translator and a Native Japanese translator. We take great care in making sure that the designs we create are absolutely correct and are happy to provide you with as much supporting material as you need to be completely confident with the translation. By doing this we are able to create a design that expresses what you want to say with a look and feel that matches your style. 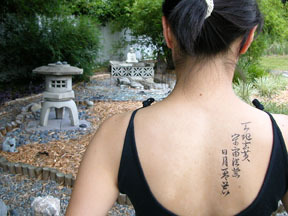 Calligraphy based Body Art Designs require mastery of the art as well as accuracy and attention to detail. You need to be able to interact with the artist at every level to ensure the accuracy and appropriateness of the design. We take great pride in providing you with all the information and feedback you need to ensure that you are getting the design that is just right for you. We work with you on each step of the design and give you the personal attention you need to you will be completely comfortable and confident with your new Japanese tattoo. Names in Japanese make beautiful tattoo designs. As an example, the design on the left is for the name Joy. 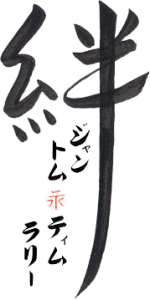 This design shows the word for Joy in kanji 喜 which is read yorokobi. Names often have meanings which can be translated to Japanese. In this case, the name Joy means “joy” and works particularly well in this design. Underneath is the name Joy in hiragana じょい which is read joi and is written horizontally from left to right. The standard way names are translated to Japanese is a phonetic translation to katakana. For Joy this would be ジョイ. Though, in fact, there are four ways names can be rendered in Japanese. To learn more visit How to Write Names to Japanese which is from an article that first appeared in my monthly column in Martial Arts Insiders Magazine. 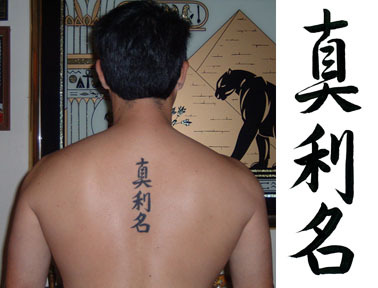 The main element of this design is the kanji for “family bonds” which is 絆 and is read kizuna. In the lower left, the name of each member of the family is written in katakana which is the standard way names are translated to Japanese. Here I have ordered it so the parent’s names are to either side in a protective position. Safe between the parents are the names of the two children. And in the middle, between the children’s names is a small red Eternity seal. While this design shows four names, the design can be done with from one to eight names.. This design is the character for Life with the loved one’s name written to the lower left. This particular design also includes a small seal meaning Eternity. There is a long history behind this design. Historically a geisha forbidden to marry would proclaim her love in a tiny version of this design. Today the meaning is to proclaim someone as being your whole life and is used for all loved ones including a fiancé, spouse, or even one’s child. While normally the design has one name, it can be done with more. In this beautiful design Love is the symbol connecting two souls. In the example on the left, the names are written in katakana which is the standard way non-Japanese names are written in Japanese. The central character in light gray is a design of the characters for Soul Mates. In the corners are the personalized names written in beautiful Japanese calligraphy. In this example the names are translated phonetically to katakana is the standard way that names are translated to Japanese.